I love things that make me feel like a little kid again; things like magic, 50 pound bags of popcorn at Costco and fresh snow. There’s something nostalgic about being truly awed, and as we get older that feeling happens less frequently. 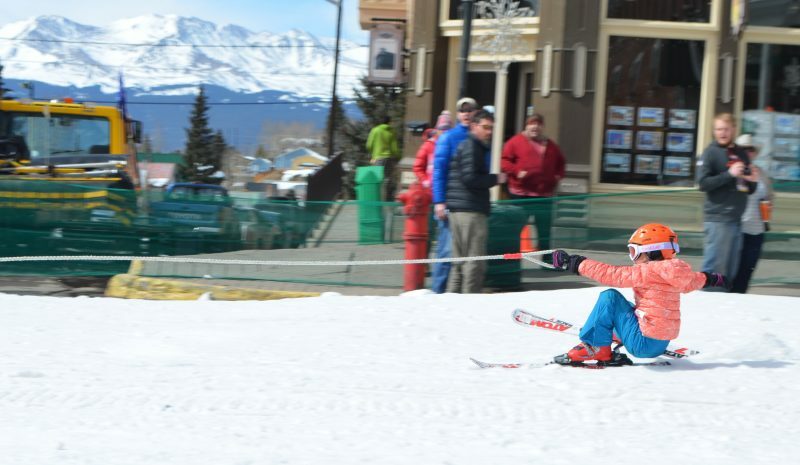 Crystal Carnival & Ski Joring Weekend in Leadville. Photo provided by the Lake County Tourism Panel. However, these three Colorado winter festivals are sure to amaze even the most stoic adult. And if you bring along the kids, they’ll have memories to last a lifetime. The fire arts seem to have gained popularity over the last five years or so. Fire performers combine the entertainment style of Cirque de Soleil with the power of combustion. It’s sort of like magic because most of us have no idea how they do what they do. Photo provided by Telluride Fire Festival. Photo by Ryan Bonneau. 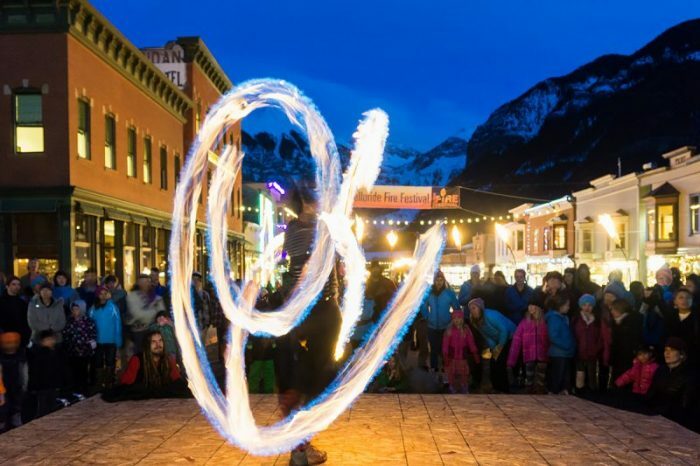 Telluride Fire Festival is in its third year. It takes inspiration from Burning Man, and has been created by an incredible group of dedicated people in Telluride. I attended the first-year event and I can tell you from personal experience that Telluride Fire Festival will make you feel like a kid again. From 5 p.m. to 8 p.m. on Friday, Saturday and Sunday, spontaneous fire performances occur around town. From art cars to fire-breathing sculptures, it’s truly spectacular. Best of all, these events are free. Additional ticketed events and workshops take place at various venues around town throughout Telluride Fire Festival. Explore their event calendar to learn more. I had heard about this Breckenridge event for years before I actually attended it in 2015, and I can honestly report that it lived up to the hype. The sheer scope of these snow sculpture is astounding, but then when you see the detail the artists are able to render in the snow, it’s downright incredible. Walking among these giant, snowy effigies gives me that spine-tingly excitement that’s a reminder of childhood. International Snow Sculpture Championships in Breckenridge, Colorado. Photo by Carl Scofield. 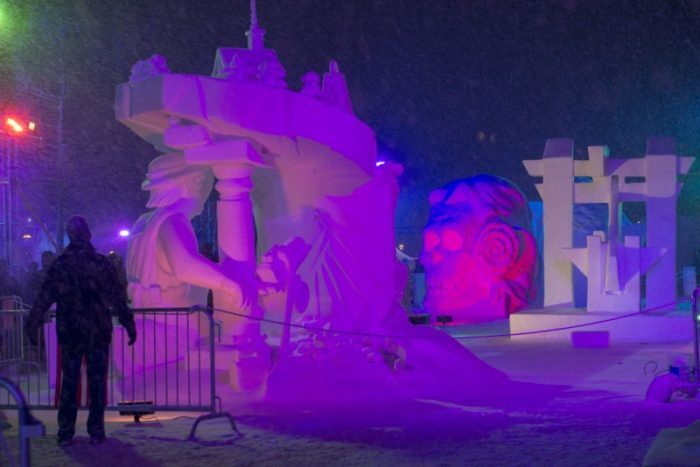 I recommend attending the International Snow Sculpture Championships towards the end of the sculpting period when the artists are finishing up their sculptures. Watching the sculptors work gives real insight to the difficulty of this competition. I also encourage you to visit once at night too. Darkness adds a certain level of magic to this event. Last, but certainly not least, I can almost guarantee that you’ll verbalize some “oohs” and “ahhs” at Crystal Carnival in Leadville. The skijoring competition at this festival is one of the most hair-raising events I’ve ever witnessed in person and I’ve watched ice climbing. The skijoring competition at Crystal Carnival is the real deal. This isn’t a stunt performance for the crowds. These are real cowboys, cowgirls and skiers who come to Leadville to compete for real cash prizes and bragging rights. 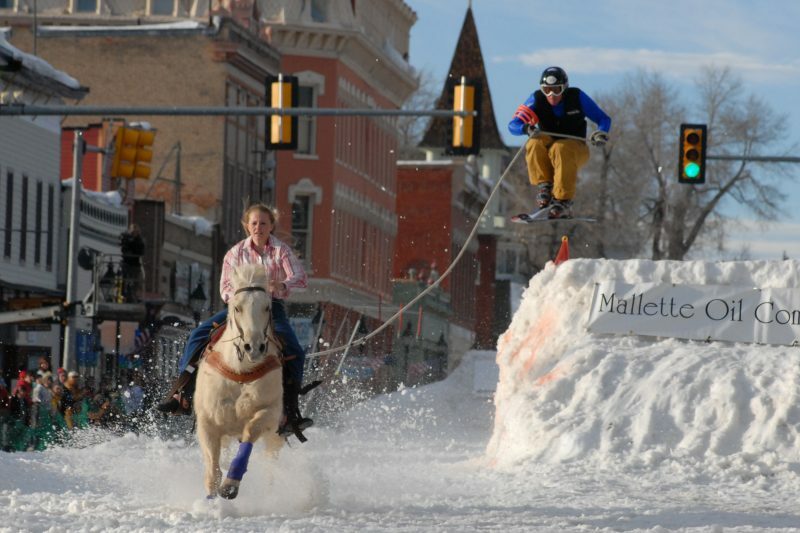 Leadville’s main street, Harrison Avenue, is transformed into a snowy raceway for the skijoring competition that occurs throughout Crystal Carnival weekend. I recommend checking the schedule and arriving early so you can get a good spot to watch, preferably around the jumps. Other events take place during Crystal Carnival including a night mountain bike ride in the snow called the Mineral Belt Mayhem, and there’s usually an evening dance at the local Elk’s Club with a live band. However, the highlight at this festival is definitely the skijoring, so don’t miss it. I had to look ski joring up. It looks like a good way to kill yourself!! At least they should wear a helment. Wow. I sound like a mommy don’t I?